Partial scholarships may be available for certain events. These are based on financial need and awarded through an application process. 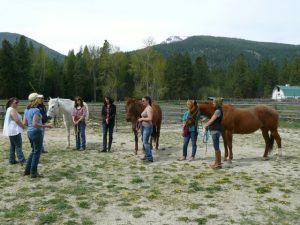 Email HEAL at leigh@humanequinealliance.com for a scholarship application. More than 30 Days Notice: Deposit will be refunded or transferred to another date during the same calendar year less a $50 processing fee. Less than 30 Days Notice: Deposit is non-refundable. Exceptions made for travel conditions or medical emergencies in which case the deposit will be treated as a cancellation with more than 30 days notice. *If a program is canceled by HEAL, any deposits paid will be refunded in full. HEAL is committed to openness, accountability and communication in its relations with students, customers and the general public. If you have a concern about any aspect of the services provided to you by HEAL, you can expect to receive respectful treatment, a timely response and clear, accurate information about your concern. It is most productive to raise any concern in a timely manner, with the HEAL Instructor involved, as the most direct route to resolution. If this is not possible, the concern should be directed to the attention of HEAL Director Leigh Shambo. If the matter is not resolved at this level you may request a hearing before the HEAL Instruction team to determine if further action is warranted. We thank you for your willingness to share any concern about the quality or safety of your HEAL experience. For more information on any of our listed events or hosting your own event please contact the HEAL office at 760-873-8980 or by email at leigh@humanequinealliance..